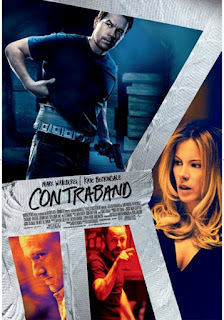 CONTRABAND is about as perfect as a caper movie gets - fast, fun, thrilling, intelligent. To be sure, it's basic plot components are pretty conventional, but it has a tricksy enough story, and enough good humour to be the perfect Friday night-forget work-have some fun movie! Mark Wahlberg plays a former smuggler turned straight, drawn back into "one last job" to save his idiot brother-in-law from the local drug dealer (a typically over-the-top Giovanni Ribisi). He assembles a crew that's going to smuggle in forged currency from Panama in J K Simmons freighter. Of course, "one last job" movies are never simple. And this one involves a double-cross back home; getting caught up in a Panamian armed robbery; an art heist; and a superbly choreographed fit-up job. A few plot twists are predictable but there are enough genuine surprises, and I love that no plot thread is left untied. The movie is directed by the Icelandic actor-writer-producer-director Baltasar Kormakur (JAR CITY) who wrote and starred in the original. Together with DP Barry Ackroyd (GREEN ZONE) he directs the movie with real style and pace, and a surprisingly light touch! There are many scenes and lines where it's clear that the smugglers are having a great time, despite or even because of the high stakes - more young kids up to some japes than Michael-Mann style existential angst. I also really liked the casting (ex Ribisi) - being particularly impressed by Kate Beckinsale, of all people!, actually doing some proper acting as Wahlberg's wife. Flicking through the IMDB review page it becomes clear that CONTRABAND has taken a bad rap for being too genre-cliche-ridden. Whatever. I had a bunch of fun watching it, and it's in my Best Of list for the year. Not every film has to be a heart-wrenching, life-changing Iranian art-house flick. There will always be room on this blog for good honest popcorn entertainment. CONTRABAND is on release in the USA, Kazakhstan, Russia, Singapore, Bulgaria, Canada, Pakistan, Israel, Kuwait, Estonia, Iceland, Romania, the Philippines, India, Syria and Poland. It goes on release in Hong Kong on February 9th; in Australia and New Zealand on February 23rd; in Portugal on March 1st; in the Netherlands on March 8th and in Germany, Finland, Ireland, Norway, Spain, Turkey and the UK on March 16th. It opens on March 22nd in Belgium, Denmark and Hungary; on April 19th in Argentina; on April 27th in Brazil and Lithuania; on May 4th in Sweden and on May 16th in France and Italy.